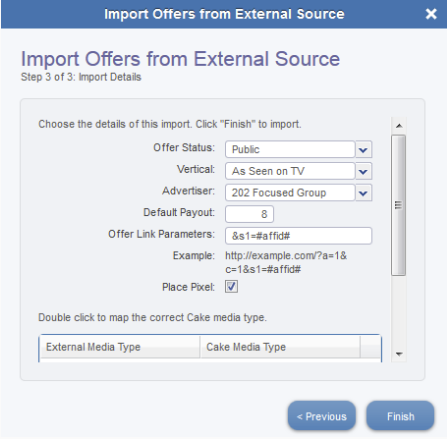 The import tool will allow you to import offers from another CAKE client, rather than setting the offers up manually from within your instance. 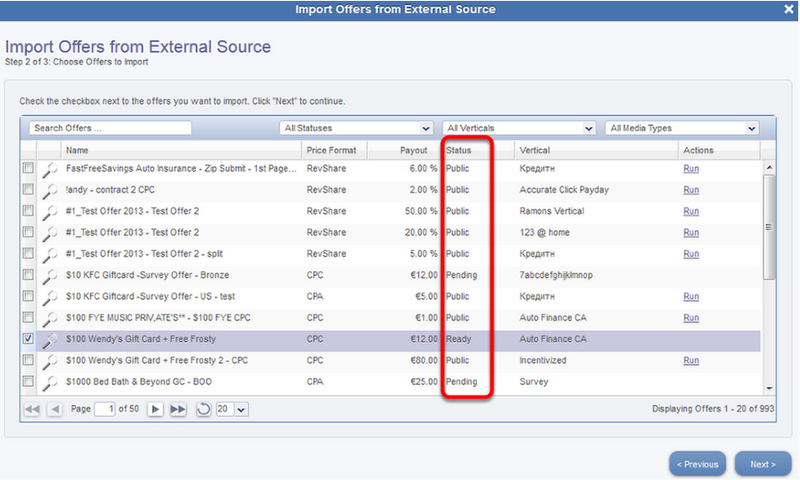 Importing offers can be done from the Admin Portal, as well as the Affiliate Portal. To access the Import Offers tool from your Admin Portal, hover over your Advertiser main tab > then Offers > and select Import Offers. Once the wizard opens you wil be asked for three pieces of information. 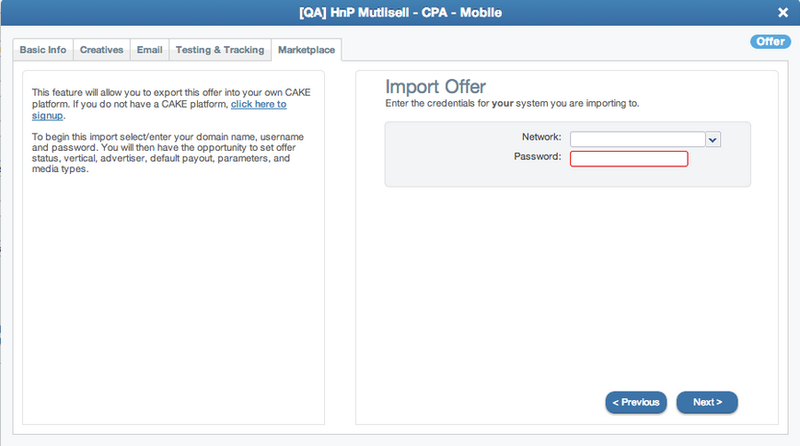 CAKE Domain: This is the domain of the CAKE client you would like to import the offer(s) from. API Key: This is your API key from the other client's system as well. 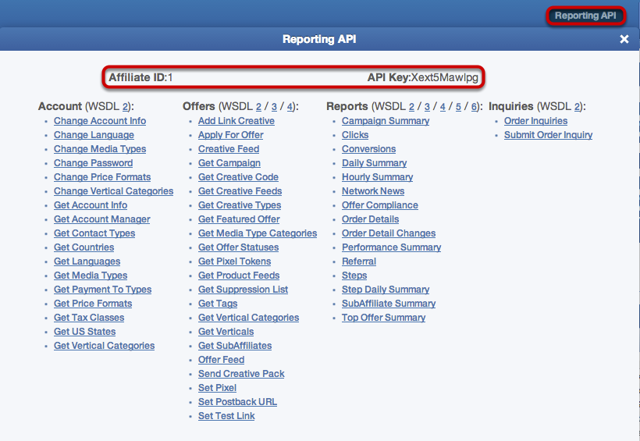 When you log into the other CAKE client's Affiliate Portal, at the top of your dashboard is a Reporting API button. If you click that button a window will open up and you'll be able to grab your Affiliate ID and API Key. Once you've added the information on the wizard you will see a window of offers from the other client that you have the ability to import. You'll notice there are a few different status options for the Offers. You can select any "ready" offer to import by checking the checkbox to the left then clicking the 'next' button. *All offers imported at the same time will need to be imported under the same vertical. If your offers are under different verticals you can either import them seperately or change the vertical from within your instance after the fact. 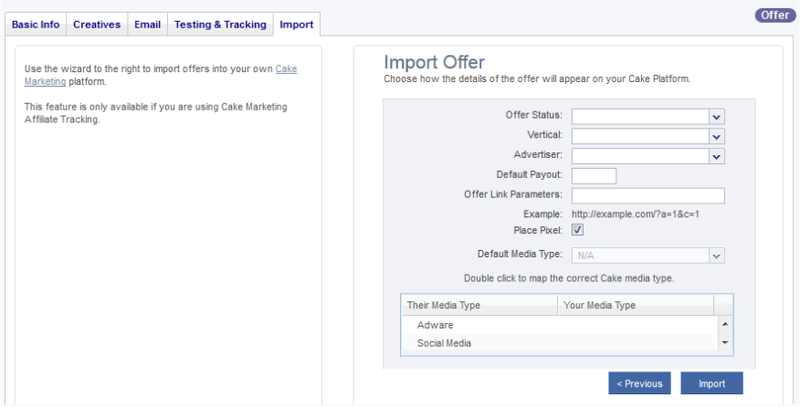 The next and final step on the Import wizard will ask for more specific details about how the offer should be imported. Default Payout: What you would like the payout to your affiliates to be. Offer Link Parameters: This section allows you to append parameters to all of your links. As you add paramaters you'll be able to see what your new link will look like next to "Example". Clicking Finish will automatically import the offer into your instance. 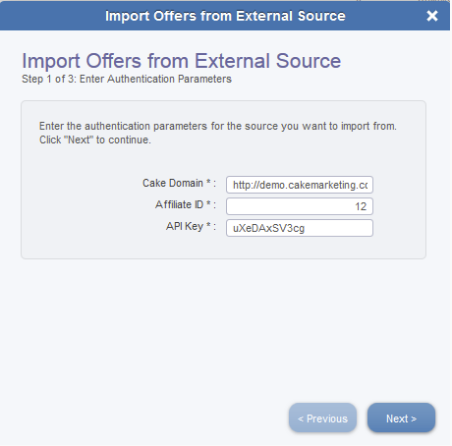 First, you have to be logged into the Affiliate Portal of the company you want to import the offer from. On the offer card you will see an Import tab all the way to the right. Within the Import tab, you will select your company name on the right where it says "Network." Once you've done that, click Next. Offer Link Parameters: This section allows you to append parameters to all of your links. As you add paramaters, you'll be able to see what your new link will look like next to "Example".